Yesterday was a day of celebrations in Paris! 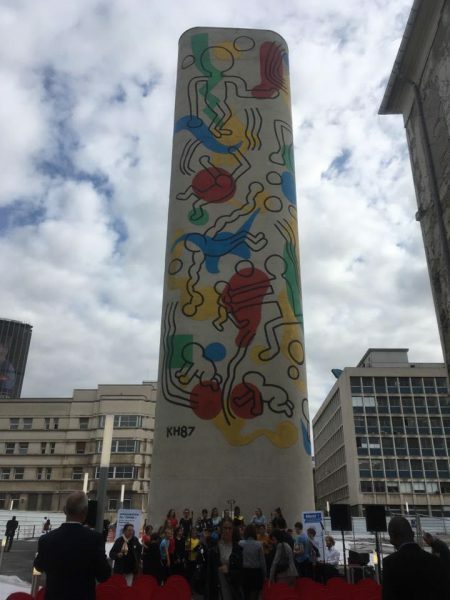 The city revealed the newly restored Keith Haring mural, a colorful spectacle on a 88.5 foot high concrete column that used to house the stairwell of the Necker Children's Hospital in the 15th arrondisement. The mural was originally painted by Haring and his partner Juan Rivera in 1987 and with its vibrant colors and shapes Haring hoped to brighten the days of the sick children at the hospital. In 2011, the hospital underwent several renovations and planned new builds as well as the demolition of some of it's old buildings. Back then it wasn't sure if the Haring mural would survive all of this or even could be restored. The mural was in bad shape and had suffered from being exposed to the elements for such a long time. However, gallerist Jerome de Noirmont and the Keith Haring Foundation got together to raise funds for the restoration and eventually succeeded at making it happen. Will Shank and Antonio Rava, widely known as the Haring mural experts, restored the beautiful mural called "Tower" to it's former glory. The mural will now be at the heart of a 97 square foot garden and will hopefully bring joy to many more generations of kids in the Necker Children's Hospital! To save the mural that Keith Haring painted in Amsterdam in 1986, Mick La Rock and Olivier Varossieau (Galerie Vroom&Varossieau) are in close collaboration with The Keith Haring Foundation and the owner of the mural.